I work in consulting. If you’re a consultant at a certain type of company, agency, organization, consultancy, whatever, this can sometimes mean travelling a lot. Many business travelers ‘in the know’ have heard the old joke that if you want to stay at any type of hotel anywhere in the world and get a great rate, all you have to do is say that you work for IBM. The point is that my line of business requires travel, and sometimes that is a lot of the time, like say almost all of last year. Inevitable comparisons to George Clooney’s character in Up in the Air were made (ironically I started to read that book, then left it on a plane in a seatback pocket), requests about favours involving duty free, and of course many observations and gently probing questions about frequent flier miles (FYI I’ve got more than most people, but a lot less than the entrepreneur I sat next to one time, who claimed to have close to 3 million). The point is that, as I said, I spent quite a bit of time travelling for work last year. 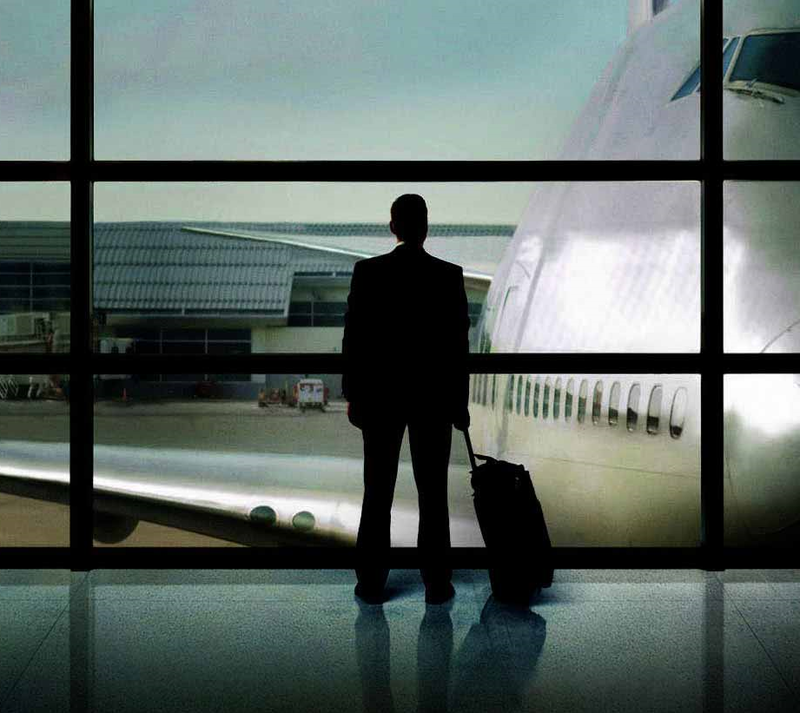 Apparently the story with frequent fliers miles is that it’s best just to pick one airline and stick with it – and this also worked out well as most companies, including my employer, have preferred airlines and so you often don’t have much of a choice in the matter. In my case this means flying Delta. So I happened to notice in one of my many visits to Delta’s website that they have data on all of their aircraft in a certain site section. I thought this would be an interesting data set on which to do some analysis, as it has both quantitative and qualitative information and is relatively complex. What can we say about the different aircraft in Delta’s fleet, coming at it with ‘fresh eyes’? Which planes are similar? Which are dissimilar? 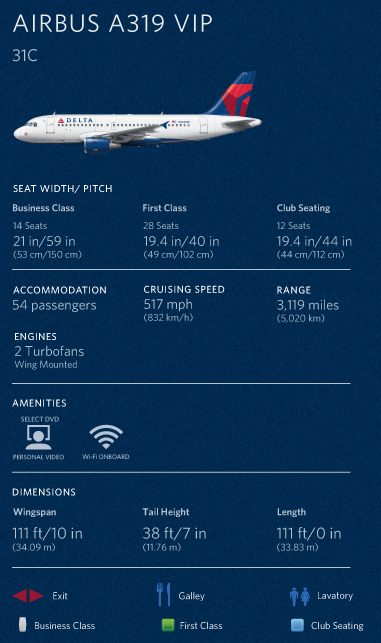 The data set comprises 33 variables on 44 aircraft taken from Delta.com, including both quantitative measures on attributes like cruising speed, accommodation and range in miles, as well as categorical data on, say, whether a particular aircraft has Wi-Fi or video. These binary categorical variables were transformed into quantitative variables by assigning them values of either 1 or 0, for yes or no respectively. 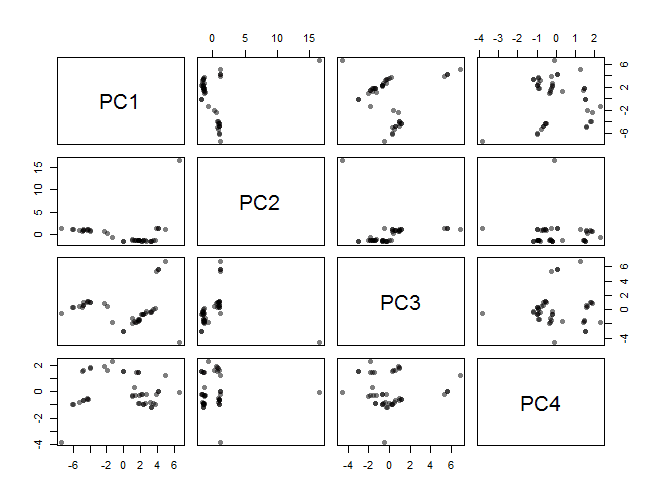 As this a data set of many variables (33) I thought this would be an interesting opportunity to practice using a dimensionality reduction method to make the information easier to visualize and analyze. First let’s just look at the intermediary quantitative variables related to the aircraft physical characteristics: cruising speed, total accommodation, and other quantities like length and wingspan. 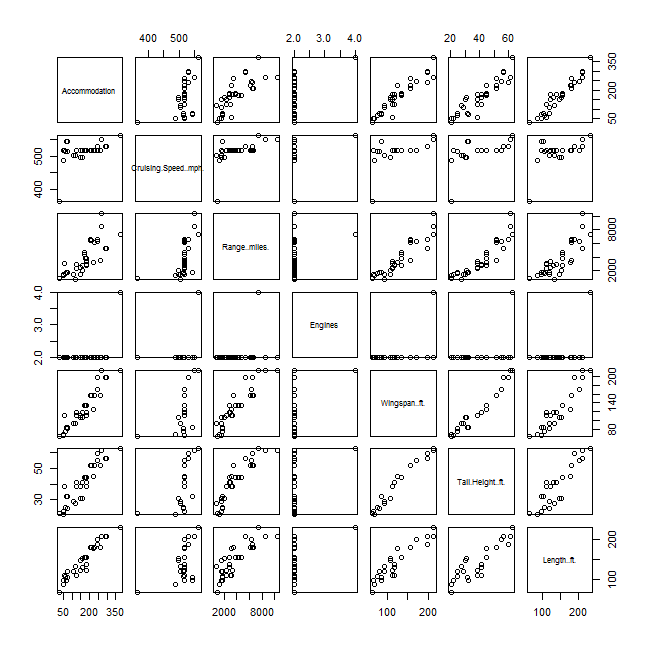 These variables are about in the middle of the data frame, so we can visualize all of them at once using a scatterplot matrix, which is the default for R’s output if plot() is called on a dataframe. We can see that there are pretty strong positive correlations between all these variables, as all of them are related to the aircraft’s overall size. Remarkably there is an almost perfectly linear relationship between wingspan and tail height, which perhaps is related to some principle of aeronautical engineering of which I am unaware. The exception here is the variable right in the middle which is the number of engines. There is one lone outlier [Boeing 747-400 (74S)] which has four, while all the other aircraft have two. In this way the engines variable is really more like a categorical variable, but we shall as the analysis progresses that this is not really important, as there are other variables which more strongly discern the aircraft from one another than this. 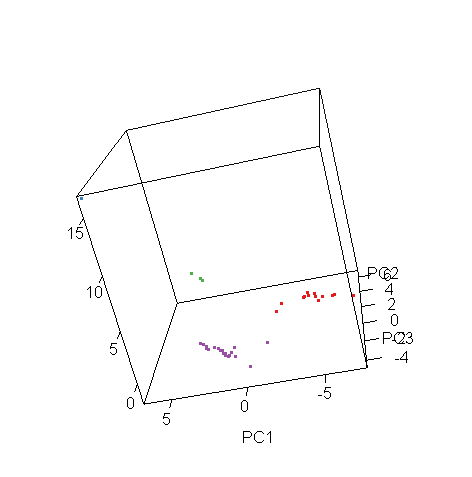 How do we easier visualize a high-dimensional data set like this one? 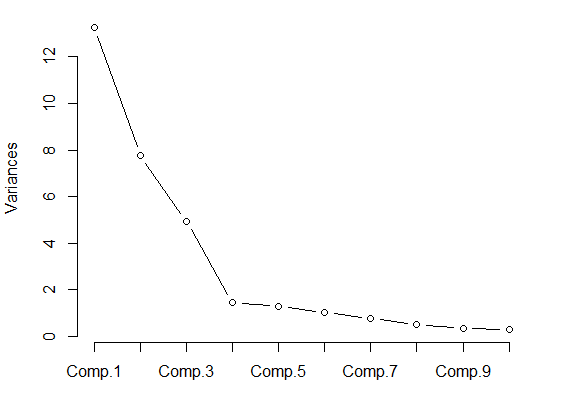 By using a dimensionality reduction technique like principal components analysis. Taking that approach we can see that the first principal component has a standard deviation of around 2200 and accounts for over 99.8% of the variance in the data. 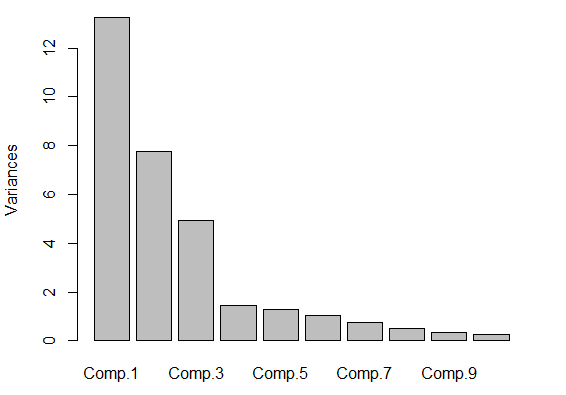 Looking at the first column of loadings, we see that the first principle component is just the range in miles. # First component dominates greatly. What are the loadings? 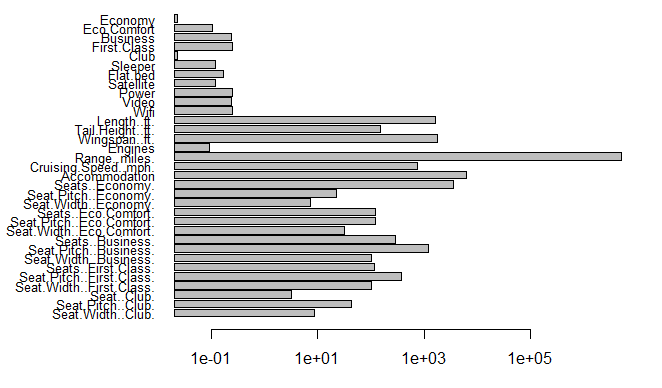 We correct for this by scaling the data using the scale() function. We can then verify that the variances across the different variables are equal so that when we apply principal components one variable does not dominate. Here we are fortunate in that these two are the same, so we will retain the first four principal components. We put these into new data frame and plot. So what were are looking at here are twelve 2-D projections of data which are in a 4-D space. You can see there’s a clear outlier in all the dimensions, as well as some bunching together in the different projections. Normally, I am a staunch opponent of 3D visualization, as I’ve spoken strongly about previously. The one exception to this rule is when the visualization is interactive, which allows the user to explore the space and not lose meaning due to three dimensions being collapsed into a 2D image. Plus, in this particular case, it’s a good excuse to use the very cool, very awesome rgl package. Click on the images to view the interactive 3D versions (requires a modern browser). 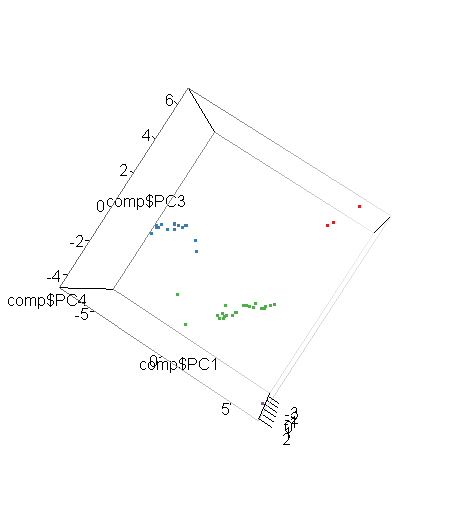 You can better see in the 3D projections that the data are confined mainly to the one plane one the left (components 1-3), with the exception of the outlier, and that there is also bunching in the other dimensions (components 1,3,4 on right). So, now that we’ve simplified the complex data set into a lower dimensional space we can visualize and work with, how do we find patterns in the data, in our case, the aircraft which are most similar? 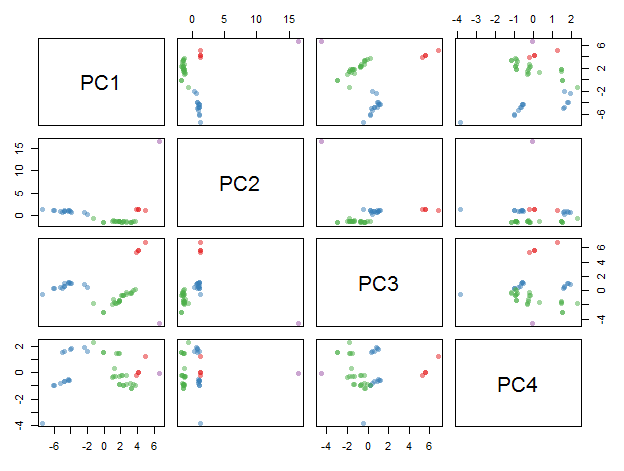 We can use a simple unsupervised machine learning technique like clustering. 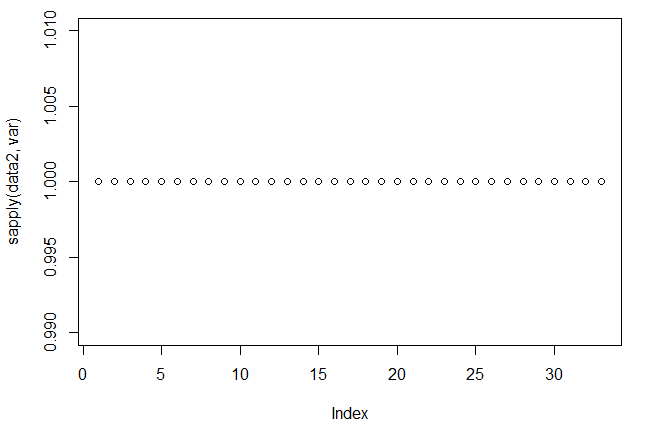 Here because I’m not a data scientist extraordinaire, I’ll stick to the simplest technique and do a simple k-means – this is pretty straightforward to do in R.
However, it should be noted that it is very important to set the nstart parameter and iter.max parameter (I’ve found 25 and 1000, respectively to be okay values to use), which the example in Quick-R fails to do, otherwise you can get very different results each time you run the algorithm, as below. 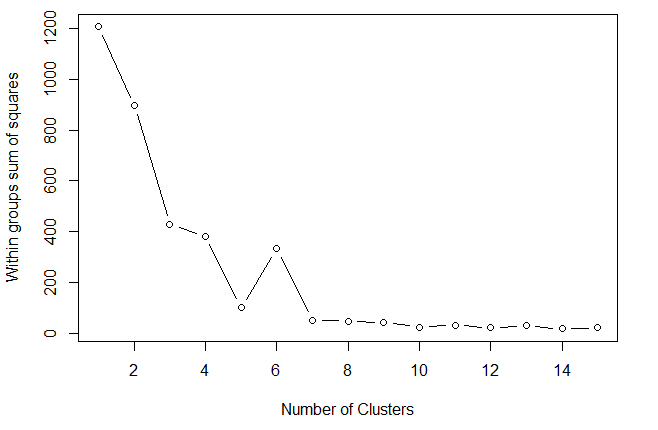 So here we can see that the “elbow” in the scree plot is at k=4, so we apply the k-means clustering function with k = 4 and plot. Ahhh, that’s the way fly (some day, some day…). This is apparently the plane professional sports teams and the American military often charter to fly – this article in the Sydney Morning Herald has more details. 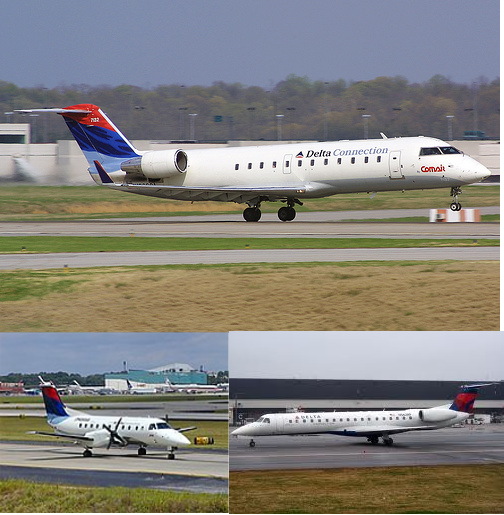 The second cluster contains four aircraft – the two CRJ 100/200’s and the Embraer E120 and ERJ-145. These are the smallest passenger aircraft, with the smallest accommodations – 28 for the E120 and 50 for the remaining craft. 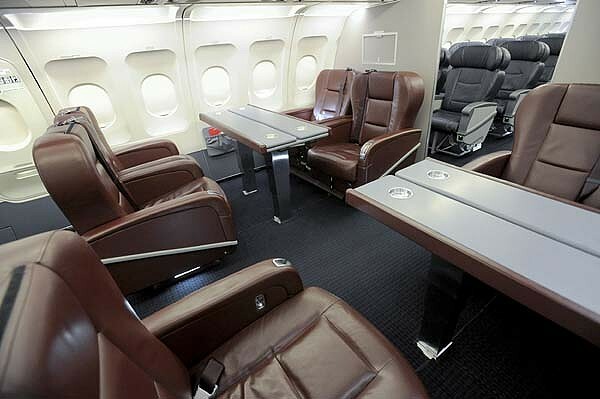 As such, there is only economy seating in these planes which is what distinguishes them from the remainder of the fleet. The E120 also has the distinction of being the only plane in the fleet with turboprops. Photos below. Top: CRJ100/200. Bottom left: Embraer E120. Bottom right: Embraer ERJ-145. The other two clusters comprise the remainder of the fleet, the planes with which most commercial air travellers are familiar – your Boeing 7-whatever-7’s and other Airbus and McDonnell-Douglas planes. These are split into two clusters, which seem to again divide the planes approximately by size (both physical and accommodation), though there is crossover in the Boeing craft. 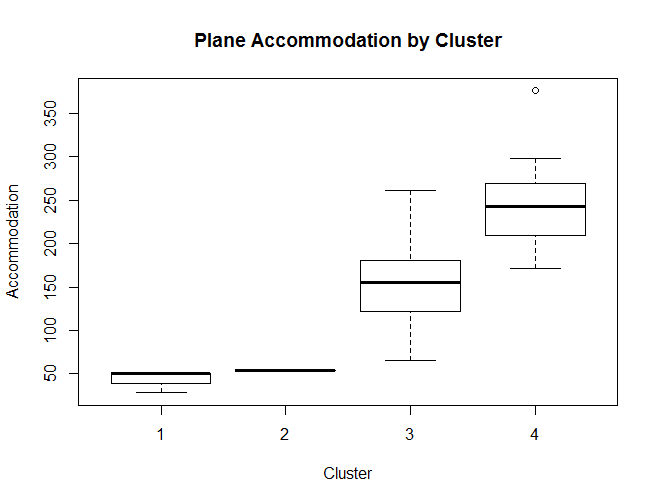 Looking at the raw data, the difference I can ascertain between the largest two clusters is that all the aircraft in the one have first class seating, whereas all the planes in the other have business class instead [the one exception being the Boeing 767-300 (76U)]. This was a little analysis which for me not only allowed me to explore my interest in commercial aircraft, but was also educational about finer points of what to look out for when using more advanced data science techniques like principal components, clustering and advanced visualization. All in all, the techniques did a pretty admirable job in separating out the different type of aircraft into distinct categories. 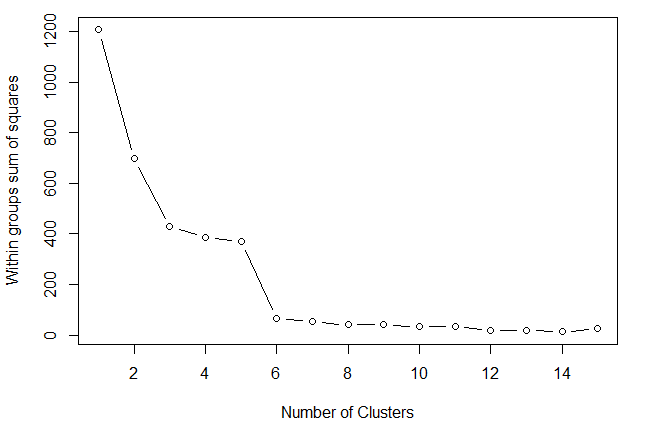 However I believe the way I structured the data may have biased it towards categorizing the aircraft by seating class, as that quality was replicated in the data set compared to other variables, being represented both in quantitative variables (seat pitch & width, number of seat in class) and categorical (class presence). So really the different seating classes where represented in triplicate within the data set compared to other variables, which is why the methods separated the aircraft in this way. If I did this again, I would structure the data differently and see what relationships such analysis could draw out using only select parts of the data (e.g. aircraft measurements only). The interesting lesson here is that it when using techniques like dimensionality reduction and clustering it is not only important to be mindful of applying them correctly, but also what variables are in your data set and how they are represented. For now I’ll just keep on flying, collecting the miles, and counting down the days until I finally get that seat in first class. How interesting! 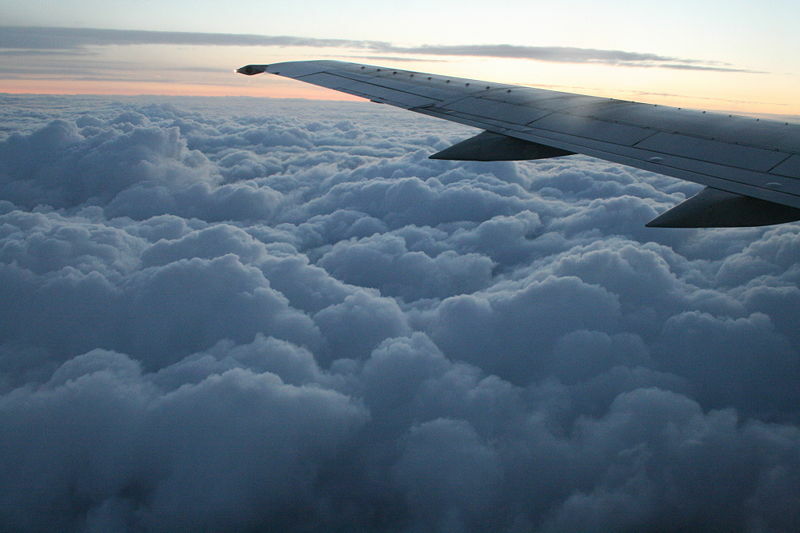 The aviation industry is so vast, and there are so many different areas you could analyze. I really enjoyed reading your findings. Thanks so much for sharing this! Thank you! And you are, of course, most welcome. Glad you enjoyed the post. I too am a consultant and so often the customer wants to know 'what's going on' in their data, such that the minute I map data from a space they get to a some derived space sends them into conniptions. 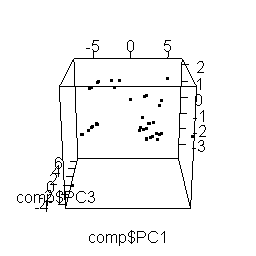 So I'd be interested in knowing how to make the principal components explainable. Often for the case of making a good prediction, no one cares. But in trying to get the customer to sign off on my work, they do care. Glad you enjoyed it, Tim. Happy to help. 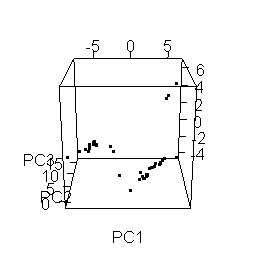 My understanding of PCA is that it accounts for collinearity by picking a combinations of variables for each principal component such that the maximum amount of variance in the data is explained by them and they are orthogonal. In fact, if you read the definition of PCA, you'll see that dealing with correlated and collinear variables is really much of the motivation behind the method. There's also some discussion on your concerns here, but let me know if you find any more documentation or a reference that suggests otherwise. I will freely admit that there are flaws in my analysis (which others have pointed out). 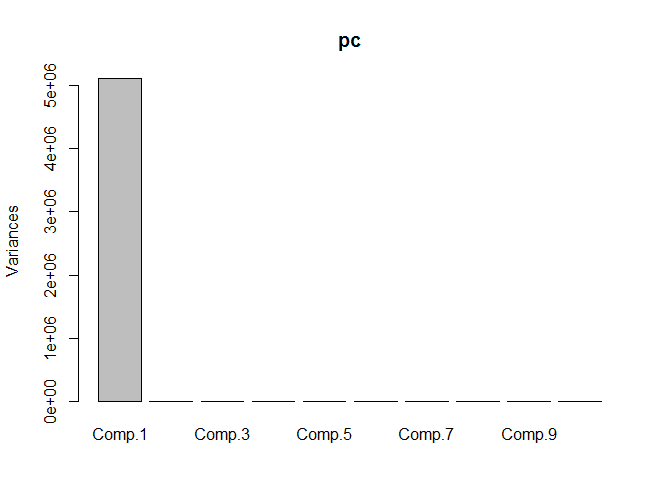 As PCA picks components that explain the maximum amount of variability, it should have been no surprise that the seat class variables became the determining factor. 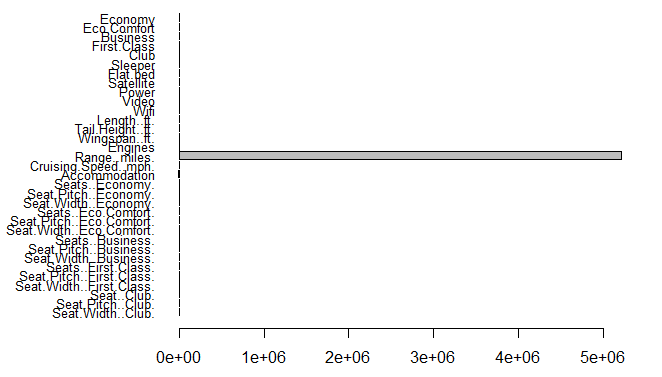 Using dummy variables is appropriate for methods like linear regression but not for PCA, as the dummy variables will always take maximum values (0 or 1) whereas the scaled numerical variables will lie in the range, a fact which I did not consider at the time but which other readers have since pointed out.